In the past, many viewed travel as a luxury. However, millennials have traveled 35% more in 2017, which means the number of family vacations is also going up. If you’re in that percentage of people traveling more, you should invest in one of the best duffel bags to bring on your adventures. When people think of duffels, they often think of the shoulder bags people use as gym bags. While that’s an everyday use for a duffel, these bags are a convenient way to hold your belongings as you travel. 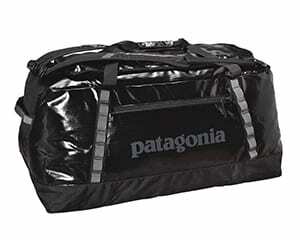 Today’s duffel bags are made of a variety of materials and come in even more sizes. You can carry them or move them with wheels. These new features have turned duffel bags in a must-have travel accessory. 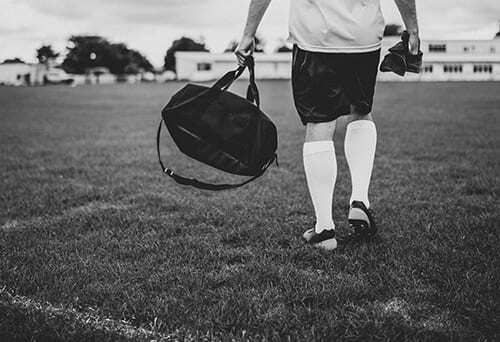 See the top 5 best duffel bags for travel and how to pick one with your needs in mind. 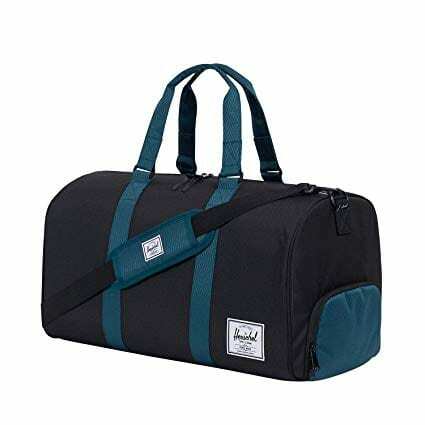 Duffel bags have been known to have a specific look. They’re usually made of thick materials, usually nylon, and look like you’re a big gym buff. For many of us, that’s not the vibe we’re trying to give off at the airport. 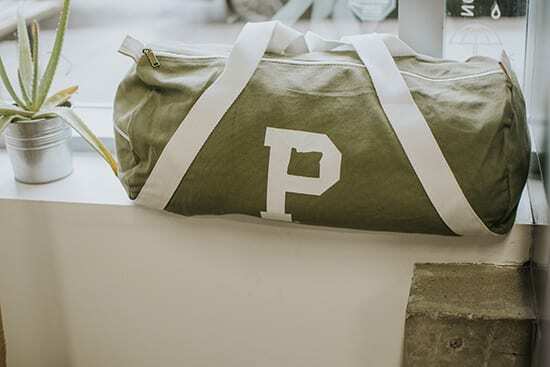 Luckily for us, there are companies out there that are making duffel bags out of different materials including canvas and leather to make them look less sporty and more stylish. As the style changes, the price tag often goes up. However, S-Zone has come out with a line of solid travel bags that won’t break the bank, and the S-Zone Travel Canvas Duffel Bag is an excellent choice. This duffel is an affordable bag that can also fit anywhere from a weekend’s worth of clothing to a week-long trip. 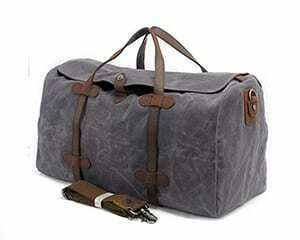 While it has a rugged chic look, the waxed canvas makes it lighter to carry and keeps your things dry. It is also roomy inside, even though it doesn’t have many compartments inside. Affordable price: You can get this high-quality bag for less than $50. Leather handles: These grab handles make the bag easy to carry, and the material is durable. Water repellent: The waxed canvas makes the bag water repellent. If you forget your travel umbrella, you’ll still be able to keep your belongings dry. Few compartments: This bag doesn’t have many pockets. If this is a necessary thing for you, you might want to pick another bag or invest in packing cubes. Weak zippers: The zippers on this bag aren’t as durable as they could be. Wrinkled fabric: The fabric on this bag can wrinkle, and it can be difficult to smooth out afterward. Herschel is one of today’s leading names in lifestyle backpacks. You can hardly walk down the street without seeing a few people carrying one. But the Vancouver company isn’t only known for the two-strapped carriers. It also has a variety of other bags for people who don’t want a backpack. Take the brand’s Novel Duffle Bag. The company calls it a “duffle bag” instead of a “duffel bag.” While this luggage option won’t hold as much stuff as a checked luggage suitcase, it’ll add something simple yet stylish to your bag collection. 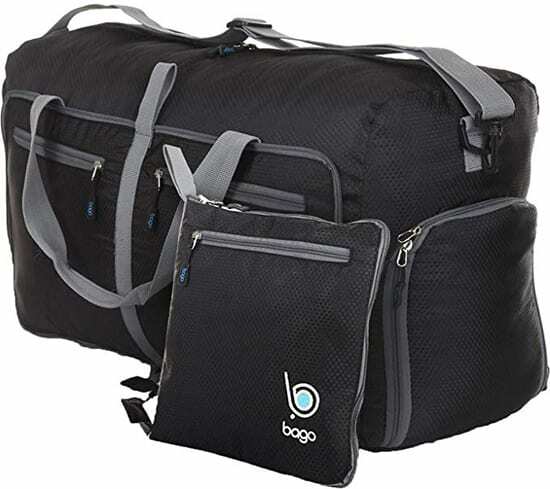 This bag can carry 42.5 liters, so it’s perfect for a weekend trip or as supplemental luggage. It has a large shoe compartment at the bottom of the bag that is big enough for a pair of combat boots or a combination of sneakers, flip flops, and flats. This bag comes in a variety of colors and patterns. While it doesn’t have a lot of exterior pockets or inner compartments, it is a reliable option for your next trip. Carry-on sized: This bag can work as your carry-on luggage piece if you want something simple and stylish as an air traveler. Shoe section: If you usually put your shoes in a laundry bag or another container to keep the rest of your bag clean, you don’t have to worry about that anymore. The shoe compartment will keep your shoes separate and securely packed. Waterproof zipper: Water won’t be able to leak into your bag because of a weak zipper. Few compartments: Although it does have a designated section for shoes, this bag doesn’t have as many compartments as you may want to keep your belongings organized. Some options not waterproof: This bag has many color and fabric options. Before you get excited about the possibilities, however, check if its waterproof. Not all of them are, and you may want a waterproof bag if you’re expecting inclement weather on your travels. Squeaky strap: The plastic parts of the strap sometimes squeak as you move. 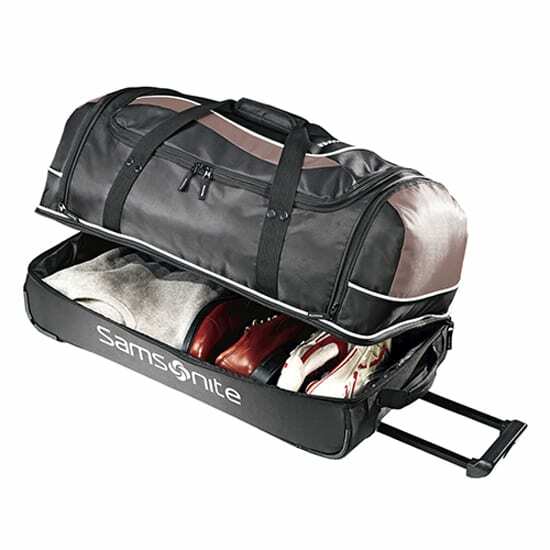 Samsonite has long been a mainstay in the luggage world, and the Samsonite Andante 22-inch wheeled duffel bag is another great offering from the company. While the size might seem small, this piece of luggage can hold a lot of clothing, shoes, your toiletry bag, and anything else you’d like to take on the trip. With the U-shaped zipper opening, packing and unpacking won’t be too hard to do, and it’s comfortable to carry. All the compartments in this particular bag will make it easy to organize. Large opening: This bag opens wide enough to keep things organized and easy to find. Lightweight luggage: No one wants a bag to add a lot of extra weight. This bag weighs a little less than five pounds, so it’s easy to carry. Skate wheels: Some people don’t like duffel bags because they don’t like carrying heavy luggage. This bag has two wheels to make it easy to maneuver or drag along if you’re tired or would prefer not to carry the bag. Larger size: This bag is at the limit of what airlines allow. Some airlines may not approve this bag, especially if it is packed full. Not water safe: Unlike some of our other choices for the best duffle bags, this bag is not waterproof or water resistant. Soft luggage: The soft exterior isn’t as protective as a hard-shell case would be. Sometimes we can’t help but buy too many gifts and souvenirs on a trip. But what do we do when we need to start packing to go home? Don’t worry. That’s what the Bago 27-Inch duffle bag is for. Rated as one of the best duffel bags you can get on the web, this luggage option will be the best solution if you’re looking for a foldable travel option. It weighs only one and a half pounds and folds up to less 13 inches all around, making this the best “just in case” bag you can toss into your luggage. Even though it’s a great backup bag, it’ll carry more than you expect. It’ll take care of all your used clothing and other soiled things or any other items you want to leave out of your suitcase, and it won’t break the bank. Perfect backup bag: This is an excellent option for people who bring extra souvenirs and gifts home. Some people even use it as a laundry bag. It’s a foldable travel option that won’t take up much room when you’re not using it. Water resistant fabric: While it won’t stand up to a downpour, this bag will help keep your belongings dry. Uncomfortable design: This duffle can be awkward to carry for some people. Weak materials: This bag might be used best as a backup bag instead of your typical piece of luggage. It’s prone to ripping and may need to be replaced once in a while. However, its affordable price means most people will get enough use out of it for the cost before it needs a replacement. 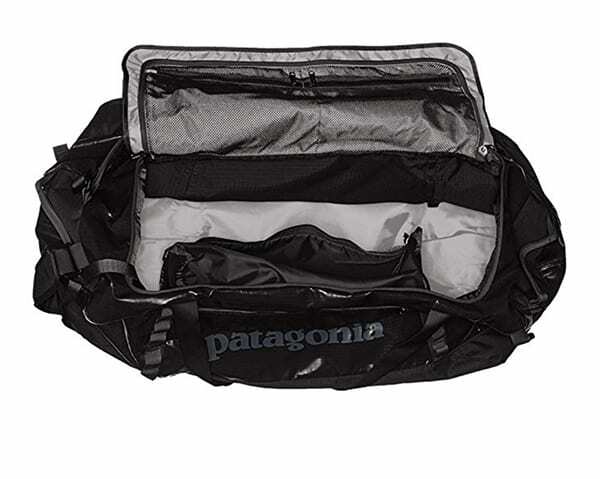 Best Large Size: Patagonia Black Hole 120 L.
Known best for its outerwear and camping gear, Patagonia also has a line of baggage that will help you get your things from point A to point B. This bag is made of water-resistant fabric so that it can go with you through all the elements. It also has a big opening for easy packing and unpacking. You can also turn the top grab handles into backpack straps, which gives you a different option for carrying. Exterior zipped pocket: An outside compartment is convenient to put things you need to access. This bag has a pocket for you to keep things like your sunglasses or ID within reach. 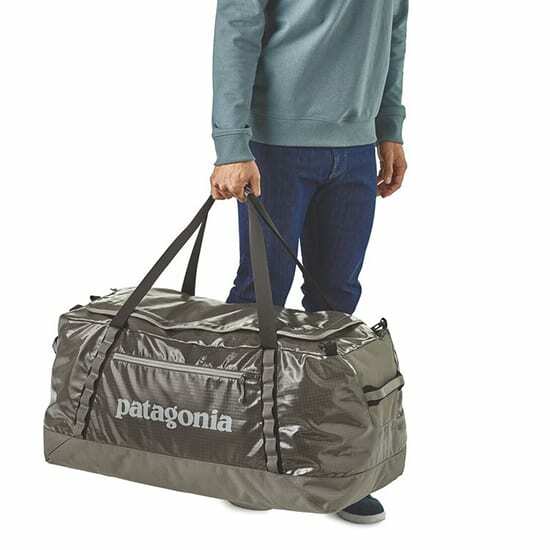 Roomy design: This duffel option has enough room for what you’ll need on most trips. Waterproof fabric: This bag will protect your belongings no matter what the weather is. Backpack feature: While the straps can be helpful, the backpack feature can be difficult to use and carry. You may be better off with a regular travel backpack if this is a feature you particularly want. Bulky design: This bag isn’t as slim and sleek as some other options. No wheels: This bag doesn’t have wheels, so you’ll be forced to carry it even if you’d rather not. Move over, basic black and white athletic duffel bags. Today’s options come in different colors, fabrics, and styles. But with so many choices, how can you pick the right one for you? Are you okay with carrying your bag or do you want wheels to make things more convenient? Does the bag have compartments to keep you organized? Do you need a removable shoulder strap? How comfortable to carry should the bag be? How easy is it to access your things from the bag? How long will you be on your trip? How much are you planning to bring with you? Will you be outdoors most of the time? After asking yourself these questions, you’ll be able to have a better idea of the kind of bag you need. Learn more about these different duffel features and details below. Traditional duffel bags have one zipper on the top, but today’s versions have improved the bag openings. Instead of putting in the zipper in one straight line, many are in a U-shape to make a bigger opening for you to pack and unpack. If you only need to remove one thing, the U-shaped zipper will allow the duffel to sustain its shape. While traditional duffel bags of the past only had one compartment, modern ones now have many different pockets, netted pouches, and other great compartments to help you organize your things. The number of compartments is a crucial thing to consider if you plan to use a duffel bag for your main piece of luggage. Interior pockets add convenience for longer trips. All the zippered pockets will allow you to stow away other things like your phone charger and travel size hair dryer so that you can know exactly where everything is. If you like using a duffel for hiking, also look for straps that can act as outside “compartments” to attach things like sleeping bags. 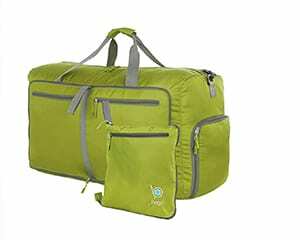 Some bags also have compression straps to help you get the most of the pockets. 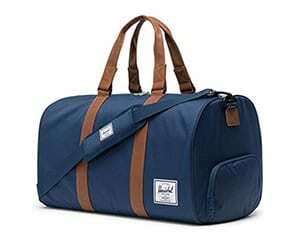 Duffel bags come in a multitude of fabrics that range from canvas to leather to waterproof materials. Like the other features in this list, the type of material you will want to go with is all based on what type of traveler you are and what kind of trip you’re going on. Style: If you want one that’s more stylish and chic, then perhaps the leather or patterned canvas ones are best for you. 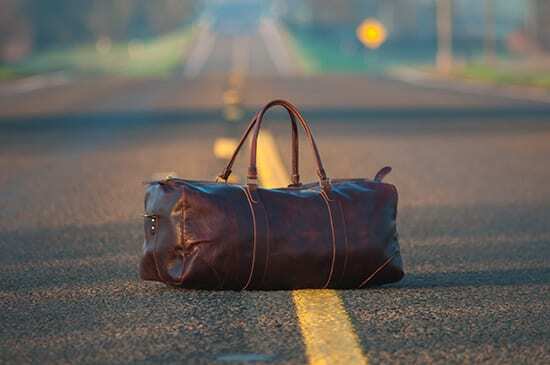 A vintage leather duffel will let everyone know the kind of style you have. Function: If you are traveling to a place that’s rainy or you’ll be in inclement weather, you might want to invest a duffel bag that has a water-resistant or waterproof material. The materials can also determine how much the bag weighs and if it’s easy to carry and how durable it is. Outdoor duffels are often made of stronger material so that you can take the bag on adventures and load it with camping gear without a problem. These tough duffels are usually waterproof and sturdy. Similarly, a gym duffel also needs to have suitable materials to protect your equipment and clothes. When they’re empty, duffel bags often look bigger than they are, but they come in a wide range of sizes. The weekender: Perhaps the smallest of duffel bags is the weekender. 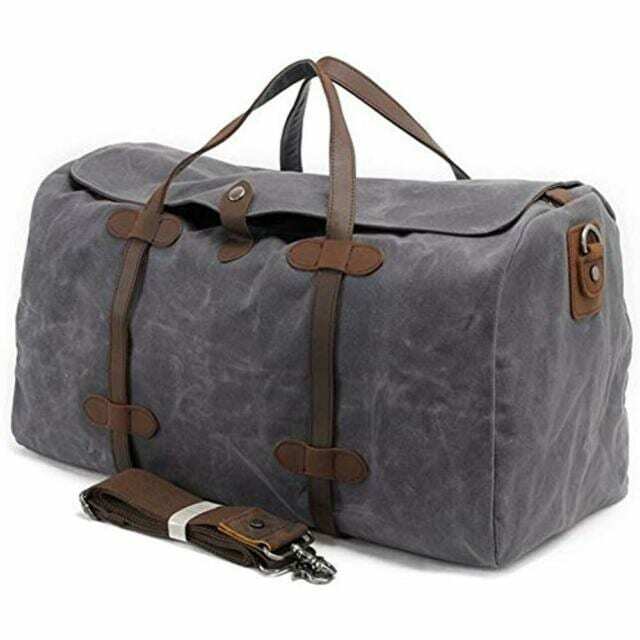 As the name suggests, this type of duffel is meant to carry one or two nights of clothing and a small toiletry bag of essentials. Carry-on: Duffel bags come in sizes that can fit as much as a carry-on suitcase or all the camping gear for your next trip. 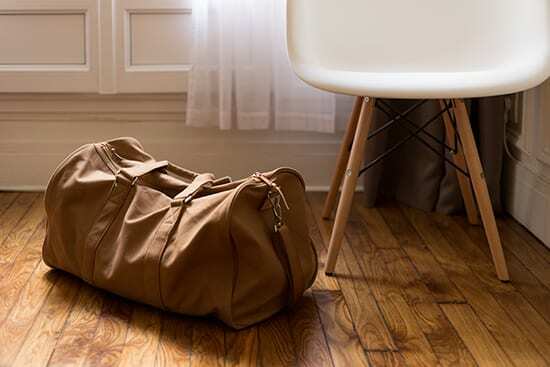 Checked luggage sized: Duffel bags even come in sizes that are about the same as a typical checked bag. Keep in mind that these are often difficult to transport and you’ll have to pay checked prices if you are on air traveler. Before walking into a shop or going online to find a bag, consider what you want to bring so that you can decide if you want a weekend bag, carry-on bag, something big, or something in-between. If there’s one aspect of the duffel bag that will get anyone thinking for a while, it’s whether or not to get one with wheels or not. The best way to approach this decision is to figure out what kind of trip you’re going on. For example, if it’s a weekend getaway, you probably will only need to carry your bag by the dual handles or the shoulder strap. You don’t want to carry your duffel. You’re packing a lot of heavy things that will be hard to lift. You want wheels to roll it around an airport. If you don’t want rolling luggage, you can also look at duffels with straps that you can wear like a backpack. One of the best duffel bags can give you flexibility and style for your travels. 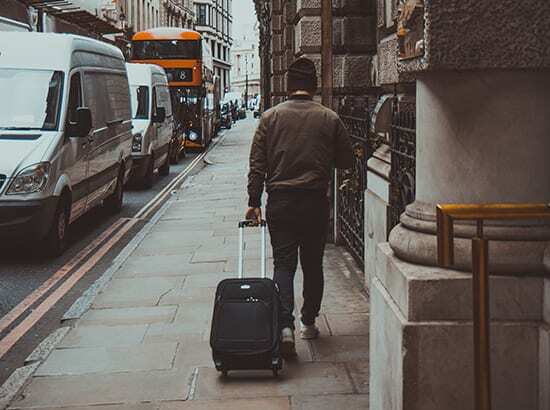 Next time you need to make a luggage decision, use our list of the best duffel bags and our buying guide to help you make the best decision for your needs. Read Reviews Herschel Supply Co.